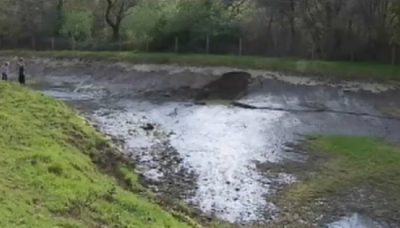 A sinkhole has swallowed a pond on Sunday stunning a local homeowner in Newcastle, California. Mark Korb has reported that he woke up on Sunday morning and noticed that the man-made pond in his garden had completely drained away. Korb has said, "This looks like the moon," according to NBC News. A massive sinkhole reportedly caused the water to drain. Korb has also described that a few years ago he manually drained the pond, and that it took him a full seven days to complete the draining. However, the sinkhole managed to drain the entire pond just overnight. "I would guess probably four to five hours for this whole area to drain," Korb said. READ MORE: HOW DO SINKHOLES OCCUR? The report comes just weeks after another sinkhole appeared in Tampa, Florida, just a few miles from yet another sinkhole that devoured a man as he laid in his bed at home. The second Florida sinkhole is not thought to pose an immediate danger to anyone, authorities reassured at the time. Hillsborough County spokesman, Willie Puz, has described that it has appeared between two homes and was about 12-feet round, 3 feet deep around the edge and about 5 feet deep in the center. That second sinkhole was reportedly completely unrelated to the one that tragically swallowed 37-year-old Jeff Bush in his bedroom prior to that. The first sinkhole in Florida gained international media coverage, leaving readers shocked as Bush was sucked down into a hole that suddenly opened up under his bedroom. Bush's family members have recalled to media that they were all preparing for bed when they heard a loud crashing sound and then Jeff Bush screaming as he was sucked down into the hole. That first sinkhole measured about 30 feet wide and 60 feet deep, and since it opened up it has become filled with clay and debris. Officials have stated that despite a thorough search it is highly unlikely that Bush's body will ever be recovered from the hole. The home was bulldozed to the ground, and officials will now move to stabilize the sinkhole so it does not cause any further issues to the other residents in the area. Already two other houses nearby the sinkhole home have been evacuated through fears that they too could collapse, as the foundations below the structures have been significantly weakened.